Andrex® wants everyone to feel as clean as possible. 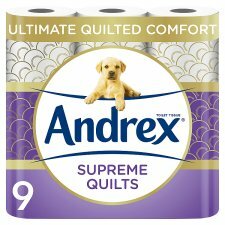 Andrex® Supreme Quilts is designed with this in mind. It has 4 deep cushiony layers of plush softness, with a touch of silk, for the luxurious clean you deserve. We recommend using Andrex® Supreme Quilts alongside Andrex Washlets® to help you feel cleaner and fresher than using dry toilet tissue alone.